Our 2017/18 Annual Report looks at how IIED's ways of working help us to deliver lasting impact in a shifting global landscape. 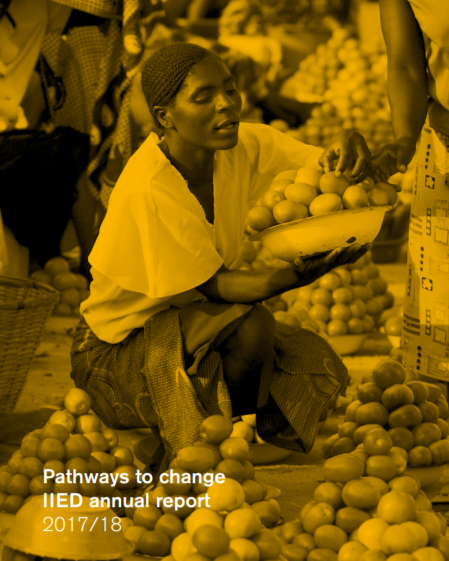 In 2017, an independent external review of IIED's work identified four 'impact pathways' – unique ways of working that help IIED to deliver lasting change. Our annual report for 2017/18 looks at how IIED uses these four impact pathways to build a fairer and more sustainable future. IIED's multi-stakeholder dialogues connect marginalised people with key decision makers. Our expert facilitation delivers co-created and locally rooted evidence – which in turn inspires policy and practice driven by social and environmental justice. During 2018 we held a series of dialogues for artisanal and small-scale mining. Our action dialogues in Ghana, Madagascar and Tanzania brought together key players to address some of the sector's most contentious issues. In Tanzania, we secured a consensus for setting up government-led ‘excellence centres’ next to artisanal mines. These centres will be hubs providing services such as business and finance training, geological data and mineral processing facilities. We are also using dialogues to drive community forestry: working with communities across the Congo Basin, the IIED-led consortium CoNGOs is helping to create more sustainable and equitable livelihoods from community forests. In July 2017, stakeholders from five countries participated in a learning exchange on 'Opportunities and approaches to supporting community forest enterprises' in Kribi, Cameroon. Across the African continent, Chinese companies are investing in natural resources. Understanding the impacts and potential of Chinese investment is a complex task. IIED organised an international 'learning event’ as part of its work on the China-Africa Forest Governance Platform. We brought together more than 90 representatives from government, companies, investment agencies, research and civil society organisations. This facilitated and frank dialogue delivered tangible results: key policy changes, commitments from Chinese companies to invest more responsibly, and several initiatives on sustainable local timber production and processing. We identify strategic opportunities for policy intervention, and work together with decision makers to create and use evidence and help them to reflect the realities of the poorest people in policy. We supported the world's Least Developed Countries (LDCs) in international negotiations on climate change. LDCs have most at stake, but are least able to cope with climate impacts. The LDCs were instrumental in shaping the Paris Agreement, but they remain vulnerable, they need the UN climate talks to secure tangible commitments. As part of the European Capacity Building Initiative (ECBI), we trained LDC negotiators to increase their influence in crucial negotiations on the rules that will govern the Paris Agreement. Some 100 delegates from more than 40 countries attended the workshops. More than 40% of participants were women, including four from Afghanistan, Angola, Comoros and Laos who attended the negotiations through our direct support. Working with local actors and partner organisations in the global South, we present policymakers with a rigorously researched evidence base for fairer ways forward. Our innovative three-year Urban Crises Fund project helped generate evidence and tools to build the capacity of humanitarian actors operating in urban areas. IIED research has identified three approaches to improve effectiveness. The project culminated in an international conference in November 2017 at which government, humanitarian agencies and researchers explored how to put the findings from this research programme into practice. Also during the year under review, Bhutan's government asked IIED to assess whether scaling up payments for ecosystem services (PES) schemes could deliver significant sustainable domestic income and support conservation goals. Our consultancy on valuing forest products evolved into a nationwide study encompassing hydropower, non-timber forest products and more. We argued for a PES programme initially focused on hydropower and nature-based tourism. This has now been embedded in the proposal for Bhutan’s 12th Five-Year Plan. We help poor and excluded people and nations to create and use evidence to ensure they are heard. The Forest and Farm Facility (FFF) is an international partnership that provides support to forest and farm producer organisations (FFPOs). The FFF vision is that smallholders, communities, and indigenous peoples and women's organisations have improved livelihoods and decision-making over forest and farm landscapes. During its first phase (2013–17), FFF channelled finance directly to more than 900 FFPOs, representing 30 million people. FFF Phase I achieved remarkable, cost-efficient impacts; Phase II begins in 2018. With audiences around the globe, IIED’s Communications Group emphasises accessibility, knowledge sharing, and innovative ways to start conversations. During 2018 we presented a new guide on using natural resources and ecosystems in adaptation work to more than 200 practitioners and policymakers at the 11th international conference on Community-Based Adaptation. Ecosystem-based adaptation: question-based guidance for assessing effectiveness, published with IUCN and UNEP-WCMC, was IIED’s most downloaded publication of 2017/18. Animations are a powerful tool for reaching diverse groups at scale. Our animation series for the Global Water Initiative, presented in both French and English, analysed complex issues relating to large dam construction. The animations were the highest performing videos on IIED’s YouTube channel, and targeted screenings across West Africa reached broad audiences including government representatives, farmer organisations, tenure experts and civil society. 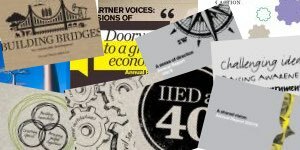 In his introduction to the 2017/18 annual report, IIED director Andrew Norton says there is much for IIED to celebrate, and he looks forward to IIED's next five-year strategy period, which he says will define IIED's ambitions to further strengthen its influence and amplify the currents of change. He says: "We are ready to work more efficiently, effectively and collaboratively than ever to make a significant difference for people and planet."